Crafting your own semi-custom nursery decor using themed items can be a simple way to create a unique nursery, without breaking the bank. I recently made a few DIY custom baby gifts for a friend. 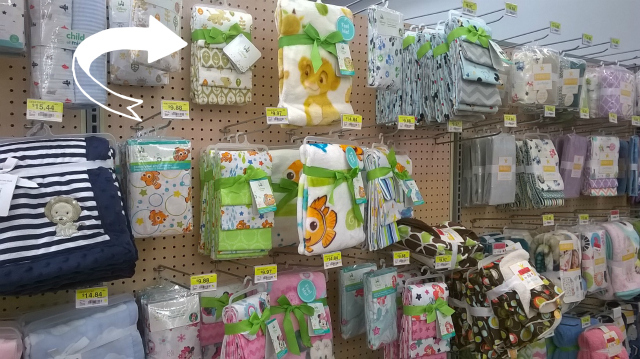 I was able to easily incorporate her Disney Baby Lion King theme, with the help of a set of coordinating receiving blankets from the line that I found at Walmart. 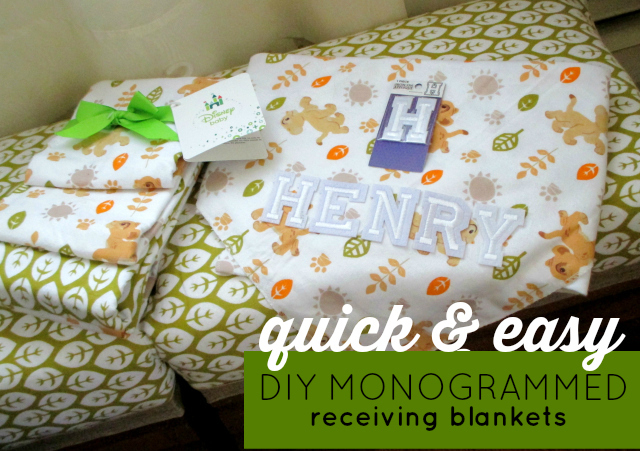 I made three custom gifts with one set of Disney Baby receiving blankets; a quick and easy DIY Monogrammed receiving blanket and quick and easy custom padded benches. As I mentioned, our friend is currently expecting her first child and her journey has been anything but easy. With the help of IVF her dreams are finally coming true, and we're so excited to help her celebrate with these fun custom gifts for her nursery! Check out the supply lists and simple step-by-step instructions for both projects, below. Embroidered Felt Letters of your choosing. Embroidery thread in the color of your choice. We used white however, you could easily use an accent color to create a cute personal touch. If you're looking for a quick and easy DIY baby project, this is it! We purchased simple soft felt embroidered iron-on letters and used them to create a DIY Monogrammed receiving blanket. Ironing instructions can vary per brand so, choose the letters that you want to use and follow the corresponding instructions on the package for ironing them in place. After we ironed our embroidered letters in place, we used white embroidery thread to stitch around the outside edges of the letters, by hand. This secures the letters to the blanket a little better for washing purposes. 3" thick upholstery foam cut to size for the top of your crate bench (we had some left over from re-finishing our sofa cushions - you can find it online and at most craft stores). A low-temp glue gun and glue sticks or fabric fusion permanent adhesive to affix ribbon to your completed bench. Start by painting your benches using a sweeping motion. Remember less is more when you're trying to replicate the stained wood look with paint. I chose to only paint the outside of my benches. I also left the tops natural as well, as I knew that they would permanently be covered with the cushions. Allow adequate time for your paint to dry. 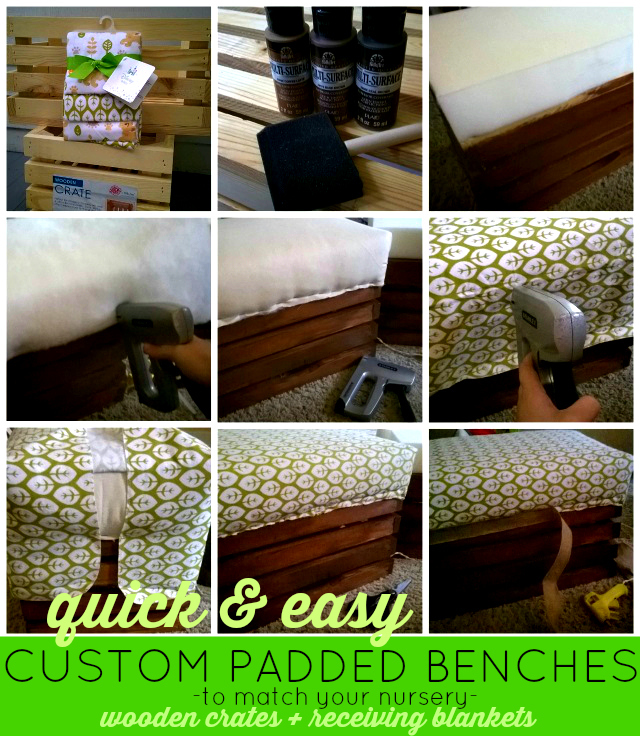 Glue your upholstery foam to the top of your bench. Allow adequate time for the glue to dry. Cut a piece of polyester batting large enough to cover the top and first 2 inches of the top of your bench on all sides. Staple your polyester batting in place. Continuously tug.pull the batting as your stapling; it should be wrapped tightly. Cut a piece of canvas sized to cover the polyester fill. Staple your canvas fabric in place. Pull the fabric tightly as your stapling. Next, use your receiving blanket to create your top cover. Staple your receiving blanket as you did with your canvas fabric, pulling tightly as you staple. Miter your corners (see image above), pull tightly, and staple in place. Trim any excess (flush with your staple line). Finish your bench(s) by affixing ribbon or edging to cover the staple line. 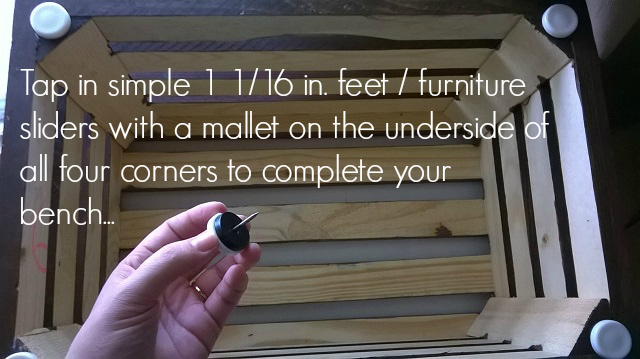 Complete your bench by tapping your 4 nail-on furniture footers / furniture glides to all 4 corners of the underside of your bench. Place two of these custom custom padded wooden crate benches side-by-side to make a great little window seat in the nursery. They're also perfect to create a little reading nook for baby, and they make a great shower gift! 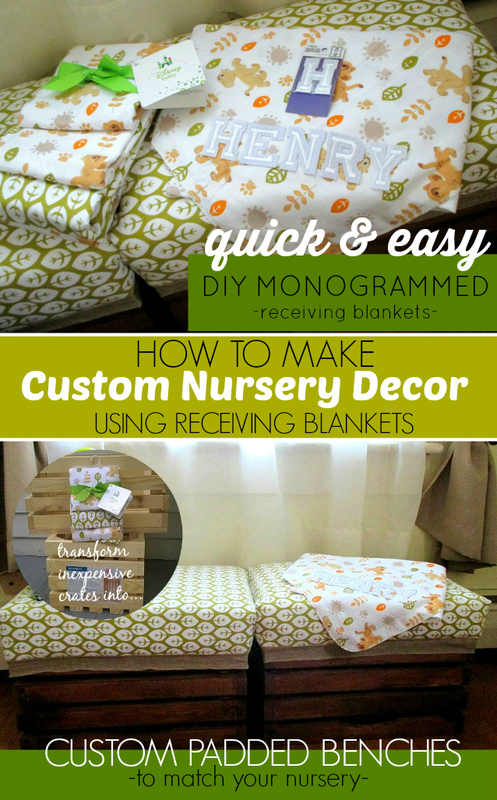 There are so many fun things that you can make for your nursery with a simple inexpensive pack of themed receiving blankets. Curtains, custom covered storage bins, throw pillows for your rocker... the possibilities are endless! What are your tips & tricks for creating custom Disney Baby nursery decor & baby shower gifts? Share in a comment below! I love the idea of a custom padded bench! I love the ideas here. Too bad I don't have anyone to make nursery items for. All of my grandkids are quite a bit older. I love the padded bench idea! For shower gifts, I like creating cute gift baskets with things like wipes, lotions, diapers items that a new mom will using a lot. The custom padded bench is so pretty! I would love one of these in my house. I have an old chest like this one, and I need to do what you did by adding new color to it!